When you need large-scale, reliable refrigeration, you need Stevenson. For over 20 years, Stevenson Industrial Refrigeration has been designing and servicing large-scale cooling systems across Western Canada. From system installations and operating support to maintenance and parts supply, we have proven our ability as a trusted partner refrigeration and industrial refrigeration companies for a variety of projects. As a company that was “born and raised” on the prairies, we have built our enterprise on the values that define our province and its best companies. Stevenson has completed a variety of work for communities throughout Saskatchewan, and is now expanding its service offerings to the rest of the prairie provinces. Stevenson believes in protecting our people – and protecting your reputation. 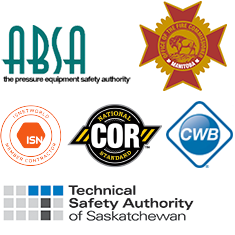 We are fully certified by major industry organizations and safety programs and maintain our standing with ongoing training, skill development and process management. © 2017 Stevenson Industrial Refrigeration Ltd.